2018: Faisal Mahmood "Jihad In The Therapy Room"
Faisal’s lecture explored perceptions of Islam compared with the reality. The word Jihad is understood as a synonym of terrorism, particularly in the western world. Given its perceived incompatibility with western democratic values, Islam has perhaps emerged as the ‘most distant other’ in recent times. Misperceptions of Islamic concepts may affect our contact with ‘the other’ in the therapy room. Faisal illustrated his belief that it is important to understand Islam and the concept of Jihad with bracketed preconceptions, in order to offer any meaningful and unconditional therapeutic space to Muslim clients. His wish was that sharing his personal and professional experiences as a Muslim Gestalt therapist would allow an exploration of our own prejudices and hence support contact and awareness. Faisal invited participants to consider their perceptions of Islam. He presented the fundamentals of Islam and its rich history, and the significant cultural differences between Muslims around the world. Faisal compared the reality with Western perceptions of Islam, which are fed by sound-bites about Jihad and stories of atrocities. He also identified western prejudice and violence against Muslim countries and peoples. Faisal talked about his background and the development of his Muslim identity. He reflected on issues that impact his identity as a Western Muslim therapist and that are significant for non-Muslim therapists. Faisal examined the difference between religion and spirituality. He looked at spirituality in the context of Gestalt and with reference to therapeutic considerations, including his experience as a client as well as therapist. His PowerPoint presentation covered perceptions of God’s presence in the therapy room. Faisal facilitated several experiential sessions in which participants explored their experiences of Islam and Muslims. Faisal was born in Alkhobar, Saudi Arabia and has also lived in Pakistan. He is currently based in Solihull, West Midlands. He is a UKCP registered individual and group Gestalt psychotherapist and BACP Registered Accredited Counsellor. Faisal works as a senior lecturer in counselling/psychotherapy at Newman University (Birmingham). He heads two programmes: the Foundation Degree in Integrative Counselling, and the MSc in Integrative Counselling and Psychotherapy. Faisal has over 20 years of clinical experience working with clients in a range of settings such as GP surgeries, hospitals, and the voluntary sector. He has a small private practice based in Solihull, offering individual, couples and group therapy. He also provides individual and group supervision. 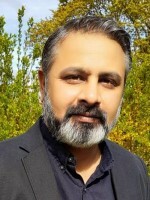 Faisal also facilitates personal development groups and Gestalt therapy theory-based CPD events in partnership with his colleague Emma Flax under their joint venture – www.gestaltgroups.co.uk. These books are available through Psychological Therapy Books who provided the bookstall at the lecture. Due to the personal information shared during the lecture, we have agreed to Faisal’s request not to offer a recording of the lecture. You can view the overheads of the lecture here.